My excitement could easily lead to way too much food, if I weren’t limited by a combination of time and resources. Needless to say, I’ve been spending the week dreaming about what I’m going to make. And, doing trial runs of potential desserts. In all honesty, jello isn’t my favorite dessert — there are a lot of things I’d prefer to eat, starting with well-made pastries, followed by cookies, ice cream …. well, you get the idea. But jello is pretty. It presents well. And there’ll be other desserts on the table, too. Inspired by the beautiful jello shots at Luxirare, I came up with a few festive flavors. You could pretty much make this out of anything drinkable that suits your fancy. The first one I tried was lime juice with pomegranate seeds, because I’m excited that lime! is! in! season! 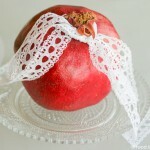 (I’m stockpiling) and because pomegranates are one of the symbols of the holiday. 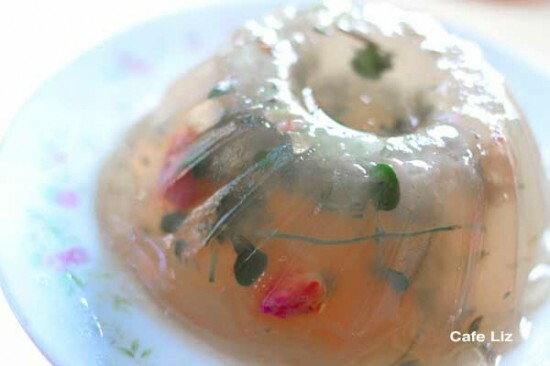 My other jello was rosewater/zuta levana, which wound up having quite an unusual, rosy menthol flavor. Warning: The addition of zuta levana makes this suit adventurous tastebuds only. Dried rosebuds gave an attractive, though expensive touch (40 shekels for 100 grams … eek. Fortunately, 20-30 grams gives you a nice handful). 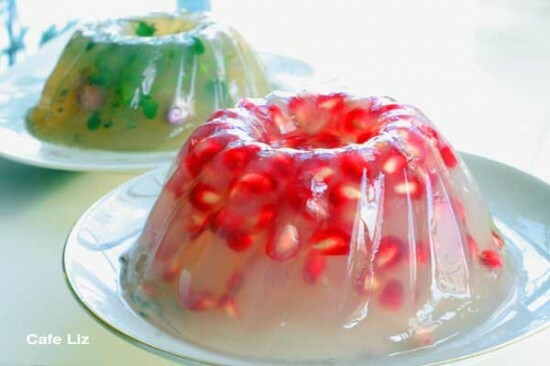 I used agar agar, a vegetarian, seaweed-based gelling agent, to solidify my jello (remember, gelatin is made of animal bones, and strict vegetarians won’t eat it. Like Eitan). 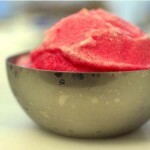 Unlike gelatin, it gels at room temperature, which is pretty cool. Each ingredient list makes enough for a 1-cup mold. I used mini-bundt pans. Shaped ice cube trays could also give cute results. Boil the agar agar with the sugar and the water for about 5 minutes, or following the instructions on the agar agar packaging. Rosewater variation: If you’re using zuta levana, crush it in the base of the mold. 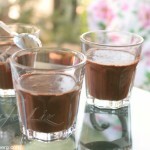 Add the rosewater and the rosebuds, which need to absorb water so that they don’t float. Lime variation: Pour the lime juice into the mold. 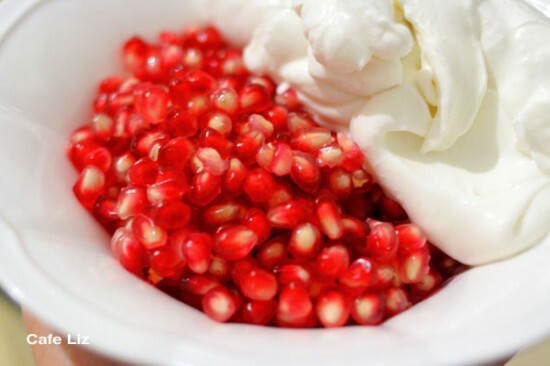 Add 1 tablespoon of the pomegranate seeds. Pour the agar agar mixture into the mold, mixing with the ingredients already there. Let it sit until it has a soft, jelly-like consistency — it will solidify at room temperature, but you can put it in the fridge to speed things up. Remember — you don’t want it to solidify quite yet. 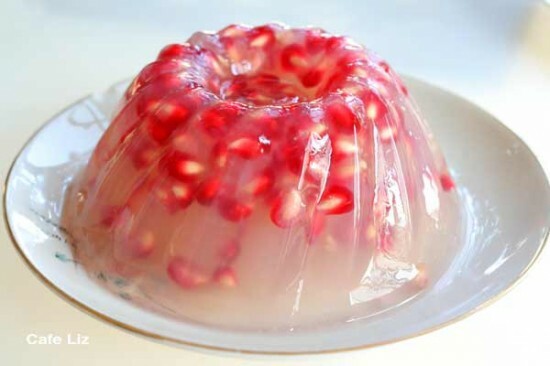 Once the jelly begins to become firm, add the solid items: The rest of the pomegranate seeds, if you’re using them. Poke the rosebuds into place, so that they sit where you want them to (preferably close to the sides, so that they’re visible). Let the jello sit until completely firm, at room temperature or in the fridge (I like my jello cold, so one vote for fridge). Flip it out of the mold, onto an attractive serving plate. 13 Responses to "Festive holiday jello, and happy Rosh Hashanah"
Rose petals are extremely cheap – you just need to find a non-sprayed rose bush..
Ora, you make an interesting point. Unfortunately, that’s not one of the things we have easy access to in the city. It’s a great option for others, though. You have a GORGEOUS website — and thank you for the fantastic recipes! I love the look of these! oh, gorgeous! I love both rosewater and pomegranates and I think I’d enjoy the heck out of both of those flavors! Planning some agar experiments myself in the next couple of days. Thanks guys! I was definitely going for presentation before everything else … which is not to say we didn’t enjoy eating them, anyway. It looks so pretty but the jello was really tough and not very tasty. I ended up throwing it all away. I think the recipe calls for too much agar agar. It was a disappointing waste since it is an expensive ingredient. Hey, sorry it didn’t work out for you. I don’t recall this jello being too tough, but I also see that I used much less agar-agar in some other pudding recipes I made. Next time I’ll try it out with less agar-agar. I love your pictures and creations – they’re beautiful! Very creative! Thank you for making such art.